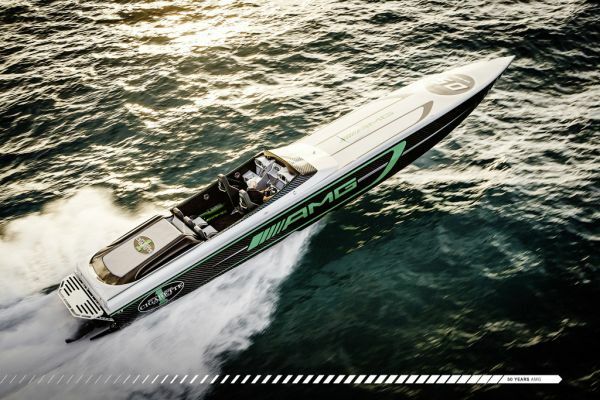 Mercedes-AMG and Cigarette Racing teamed up again this year to continue to set new benchmarks and push the limits of performance by presenting the Cigarette Racing Team 50’ Marauder AMG boat inspired by the breathtaking Mercedes-AMG GT R.
The two legendary performance brands are proud to celebrate 10 years of collaboration with this awe-inspiring new boat unveiled today at the Miami International Boat Show. From the intelligent lightweight construction to the wealth of innovations, the Mercedes-AMG GT R and the 2017 50’ Marauder AMG are true pioneers in their respective segments, perfectly exemplifying the Mercedes-AMG core philosophy to deliver high-performance. Designed for high-speed and further improved dynamics, carbon-fibre was employed extensively in the design of the 2017 50’ Marauder AMG to help shed more than 1,300 pounds. In addition, the deck, cockpit and consoles were developed using advanced laminate analysis techniques and are all constructed from carbon-fibre with foam core. The engine hatch is also completely carbon fibre, employing vacuum infusion technology for its construction. The sporty cabin layout is race-style, and even the electrical system has taken weight savings into consideration to maximize performance. "Performance, perfection and passion are the values that unite Mercedes-AMG and Cigarette Racing. Based on these values, eight sensational special editions have been created during our successful ten years of collaboration, and the 2017 50’ Marauder AMG presented here is a particular highlight among these. The new Edition is thus a symbol for the ten-year partnership with Cigarette Racing as well as for Mercedes-AMG's 50th anniversary," says Tobias Moers, Chairman of the Board of Management of Mercedes AMG GmbH. “The 2017 50’ Marauder AMG is a particularly striking result of our continued collaboration with the Cigarette Racing Team, and a fitting tribute to honour 10 years of working together,” said Gorden Wagener, Chief Design Officer for Daimler AG. “From the very beginning we were confident that Mercedes-AMG would be the perfect partner as our companies both take great pride in our triumphant racing heritage and maintain a steadfast focus on pushing the limits of performance,” said Skip Braver, CEO of Cigarette Racing. The Cigarette Racing Team 2017 50’ Marauder AMG is powered by a pair of Mercury Racing 1550/1350 QC4v (Quad Cam 4 Valve) engines and M8 stern drives, delivering up to 3,100 hp. These sophisticated powerplants are dual calibration engines, which enable the operator to switch engine power levels through an electronic key fob. The Race Key fob unlocks up to 1550 hp, requiring race fuel. The Pleasure key fob is used for operating at 1,350 hp with 91 octane fuel. Stylistically, the Cigarette Racing Team enlisted Gorden Wagener, Chief Design Officer for Daimler AG, to design the paint and detailing. The interior seat inserts were crafted by the AMG Performance Studio with a unique and striking geometric patterning. 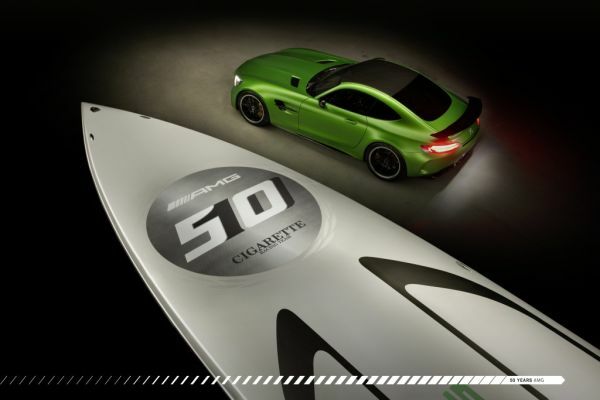 To mark Mercedes-AMG’s 50th anniversary and commemorate the 10 year partnership with the Cigarette Racing Team, a special logo has been developed that is prominently displayed on the bow of the vessel. 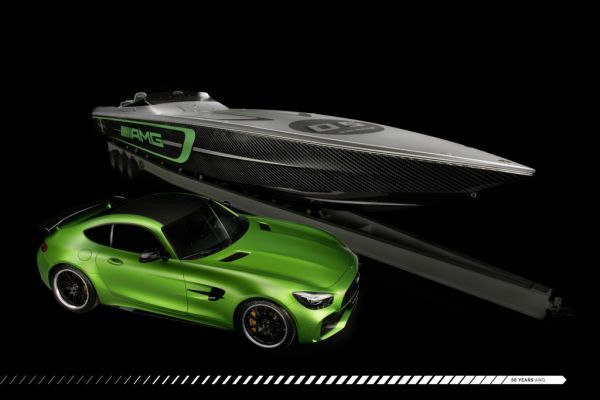 The distinctive Green Hell Magno paint details on the boat create an instant connection to the Mercedes-AMG GT R and the infamous “North Loop” of the Nurburgring racetrack where the GT R achieved an awe-inspiring 7:10.92 lap time. Never before has Mercedes-AMG packed so much motorsport technology into a production vehicle. The front-mid-engine concept with a transaxle, handcrafted AMG 4.0l V8 biturbo engine rated at 577 hp, extensively modified suspension, new aerodynamics and intelligent lightweight construction laid the foundation for an especially dynamic driving experience. In addition, the unmistakable AMG Panamericana grille celebrated its standard-production premiere in the Mercedes-AMG GT R, with its 15 chrome-plated vertical fins inspired by the look of the new AMG GT3 race car and the Mercedes-Benz 300 SL that won the legendary Panamericana Mexican road race in 1952. Mercedes-AMG and Cigarette Racing began their collaboration partnership in 2007, primarily for organizing joint customer and marketing activities. Whether on land or water, Mercedes-AMG and Cigarette Racing are united by their focus on delivering the ultimate in performance. Similar to its Mercedes-AMG super sports counterpart, the 38’ to 50’ long powerboats from the American specialists are among the world's fastest and most exclusive machines. These boats feature custom-made, handcrafted quality for enthusiasts and are tested under the most extreme conditions. Mercedes-AMG and Cigarette Racing share similar DNA makeups: both companies have triumphant racing roots and are still dedicated to this passion. The Miami International Boat Show is open to the public from February 16-20, 2017 at the Miami Marine Stadium Park & Basin. For more information, please visit miamiboatshow.com. BMW Sailing Cup: Deutschlandfinale erstmals am Tegernsee.